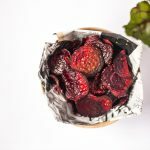 » Recipes » All Recipes » BEETROOT CHIPS WITH ORANGE AND SEA SALT & HUGE GIVEAWAY! Baked root vegetable chips are a healthy alternative to your average store-bought tortilla or potato chip. It may seem like a lot of work to peel and slice vegetables, but I promises you it’s not such a big deal. Today we have for you Beet Root Chips. Even those who hate beets will love them in chip form. This recipe from Nourish And Inspire uses unrefined coconut oil. Not only do the rings make these chips look cool, but the beets’ natural sweetness makes them a seriously addictive snack. Move over potato crisps and hello Beetroot chips! Have you ever tried Beetroot chips? Well the ones you get from the store in a packet are not doubt cooked in canola or sunflower oil and potentially have added sugar. So to bypass all that crap, cook your own beetroot chips at home. It’s easy and you can add a little twist! …. A twist of Orange juice… trust me. Oranges go great with beetroot. In juices and even adding a little orange juice to the dressing of a beetroot salad is delicious!. Try it! These chips would be perfect for the little kiddies too. They’re gluten-free, dairy-free, sugar-free and a good way to get them eating a very nutrient dense vegetable. Cleansing the liver: back to the doctrine of signatures again where food presents clues as to what properties the food might contain or what it might be good for. Beetroot juice looks like blood and it helps to cleanse the blood of toxins. Lifting your mood and reducing stress due to betaine and tryptophan which are sometimes used to treat depression and stress. Tryptophan is an amindo acid that helps to enhance your mood. Packed with vitamins and minerals such as: vitamin A, B and C, iron, potassium, fibre and phosphorus. Lowers blood pressure: the nitrate in vegetables and also the antioxidants it contains help to maintain a healthy cardiovascular system. Increases energy and stamina: beetroot is high nitrate which expands blood vessels, it’s made into nitric oxide in the body which increases the efficiency of oxygen in reaching the cells, thereby decreasing the overall amount of oxygen that the body needs. This slows fatigue and increases efficiency, so if you’re an athlete beetroot juice may be your best friend! My name is Arie-Elle and i’m a health and wellness blogger and co-founder of Nourish & Inspire Me. I believe food is medicine and that healthy eating should be joyful, nourishing and delicious! I create recipes that are unique, fresh, and simple. My food fits into many diet categories including Paleo, Veg- an, Gluten-free, Dairy-free and Sugar-free. Amongst my passion for all things health, fitness and wellness, i am also a food stylist, photographer and Singer/Songwriter. I hope to share my music and creative work with the world and inspire others to live happy and be well. Conect with Arie-Elle on Facebook or Instagram. 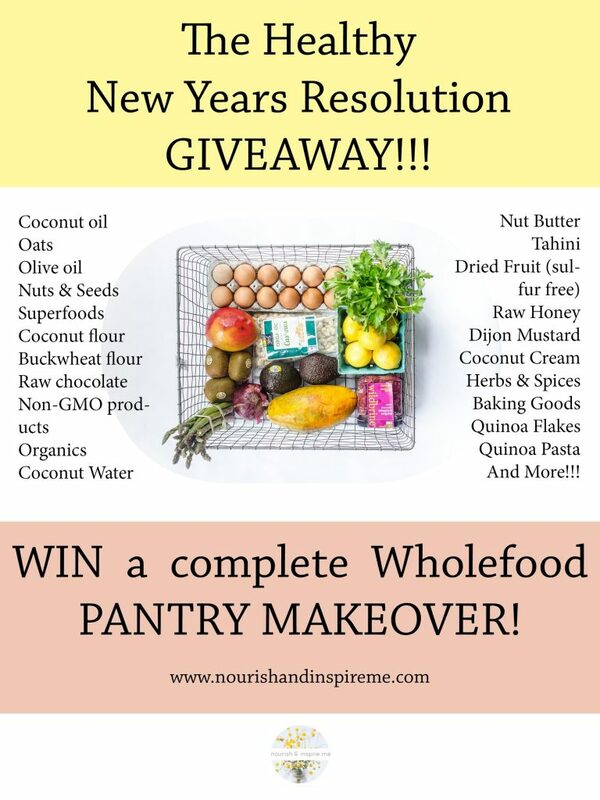 To kick start your healthy 2015 Nourish & Inspire is running a huge giveaway and it’s a complete Pantry Staples Make-OVER! I’m talking coconut oil, sea salt, super foods, baking goods, nuts, seeds and lot’s of other goodies that will get you on your way to making you the healthiest you can be AND making cooking healthy meals easier in the new year. We’ll also be doing runner up prizes which will include a 6 pack of Remedy Kombucha, a Jax Coco pack, Wholefoods Market vouchers (USA only), and an assorted Terra Madre pack. SO HOW DO YOU ENTER TO WIN! ?